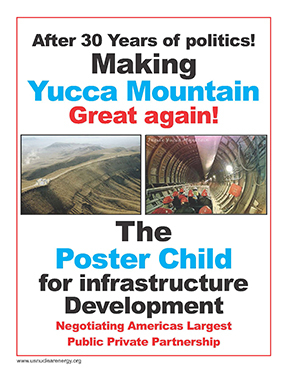 We produce literature and printed collaterals about nuclear technology the nations need for the Yucca Mountain Repository, Renewable Energy, Advanced Reactors, Above Ground Storage, etc. Our mission is grassroots education to renew, reuse, and recycle our nuclear industry. We have held presentation meetings, organized small tour groups to the Idaho National Laboratory, addressed ANS communications workshops, the USNIC Advanced Reactor Technical Summit III, produced and conducted educational symposiums and manage a website with a considerable amount of nuclear information for public review. We have an impeccable group of people on our Advisory Board who carry significant industry experience willing to write character references about the mission and integrity of the US Nuclear Energy Foundation. Meet them at: http://www.usnuclearenergy.org/advisory-board.html . It’s not about supporting a FOUNDATION; it’s about SUPPORTING what it does! Also listed below, a couple of industry related contacts aware of our grassroots educational mission to rebuild the nuclear technology grassroots message.